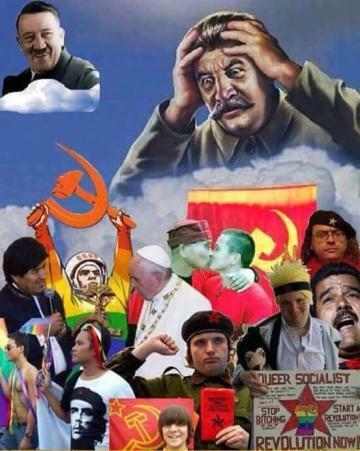 As a communist, I'm stil a little ticked at DA's tarring me by association with these misguided lunatics. Communism is not about destroying families and communities. It is not about a bunch of dudes in dresses or in a daisy chain. It is not even about personal choice. It is simply an equal division of the money. Yeah I might be a bit communist. So all the people who called themselves communists -- Lenin, Stalin, Mao, Pol Pot for example -- and did indeed destroy families and communities on the grand scale, fully comparable with the Nazi atrocities, were mistaken? Poor old Marx and Engels got it wrong in the Communist Manifesto when they said "the theory of Communists may be summed up in the single sentence: Abolition of private property", and "The Communists disdain to conceal their views and aims. They openly declare that their ends can be attained only by the forcible overthrow of all existing social conditions", or later "From each according to his ability, to each according to his needs". Poor old Marx and Engels got it wrong in the Communist Manifesto when they said "the theory of Communists may be summed up in the single sentence: Abolition of private property", and "The Communists disdain to conceal their views and aims. They openly declare that their ends can be attained only by the forcible overthrow of all existing social conditions", or later "From each according to his ability, to each according to his needs". Marx and Engels' statements as quoted here do not contradict my summary. They believed that private property was the prerequisite and the cause of the gross inequalities which arise under capitalism, and that private property originated as theft. Bearing in mind that Marx was a historian, both these claims are historically accurate. I cannot see the problem with "From each according to his ability, to each according to his needs," though some might dispute their use of pronouns. I'll guess that most people would accept this as a description of an ideal society. Even capitalism claims to fulfill this, inasmuch as there are opportunities for people to develop their talents and apply them for the greater good and people are free to dedicate the resources available to them to what they need the most, as well as the assertion that capitalism leads to more of these resources to go around. However, I emphatically reject the social theories put forth in Engels (1884) which were based upon serious misunderstandings about aboriginal society and the development of the family; I've discussed this elsewhere on this board. I certainly disagree with the "overthrow of all existing social conditions", which anyway is prima facie insane and I doubt that they themselves can have meant it: surely there are some social conditions they thought were alright? Overall I am wary of their futurism and find it unnecessary when near-absolute economic and social equality are features of a great number of attested societies. There are no great examples of that level of equality in modern economies, even communist ones, modern societies after all being divided into the rulers and the ruled, and the rulers, whether the state or employers or landlords are always going to take more for themselves. Even so, it's not hard to find examples of modern societies which are both properous and a whole lot more egalitarian than ours. As for Lenin, Stalin, Mao and Pol Pot, first I would hardly place all of them in the same basket (and Hitler! Really, Lenin was just as bad as Hitler? ), and second would not hold any of them up as models to emulate. Marx and Engels were remarkably vague about how this "dictatorship of the proletariat" would work in practice. So, while one cannot say "this is part of Marxism", it is also difficult to say for a fact that it isn't. Besides the egregious excesses which characterized the 20th century in general – the list of offenders here is very long – I would identify the common tyranny as rule by strangers, who think nothing of ruining or terminating other people's lives to fulfill their ego-driven visions. This psychology is alive and well in capitalism too; just look at slavery in which the vision was to make money. Communism should not be a philosophy which replaces all other philosophies and understandings. The justification for it is fundamentally moral, which presupposes the existence of a morality which remains valid on its own merits. And one would be foolish not to see that the framers of the American constitution had a much greater understanding of how statism is likely to go wrong than did the founders of the USSR, even if this understanding was misused to preserve economic inequality generally and slavery in particular. Anyway, my point as you'd quoted was simply that communism doesn't, or at least shouldn't, have much to do with liberalism and in several obvious ways is opposed to it. From your comments, it would seem that you agree with this much. I would say that Marx's version originated in part as a way to reframe criticism of capitalism in such a way as to disentangle it from romanticisim and antisemitism, which he identified with the interests of the aristocracy that capitalists were replacing, but that's its own discussion. Last edited by Proabivouac on Fri Aug 03, 2018 4:05 am, edited 3 times in total. Never seen it, but it's hard not to sympathize with Uncle Joe. Yeah, "progressives" mix them up. But when it comes time to make a choice, it's always economic equality which gets traded away in favor of this kooky march-o-progress. Obviously Trump is no communist, but he is probably better and certainly no worse for workers than HRC etc. The people who despise him the most are the professional classes. He is no Hitler, but it would be fair to place him schematically in the camp of right wing populist reaction, and you could just as easily add his face laughing as obviously the working masses are not going to follow this stuff. The evolution of the concepts of private property and individual rights, and the rule of law, and equality before the law, are sufficiently complex that the summary "private property was the prerequisite and the cause of the gross inequalities which arise under capitalism, and that private property originated as theft" can best be characterised as just plain wrong. However, I think I'm right in suggesting that the abolition of private property is a prerequisite for the "equal division of the money" which you place as your priority. If you mean numerically equal, then that is not consistent with "to each according to his needs", as people who are very young, or very old, or very sick, need a larger and so unequal share of resources. Which do they get? Numerically equal, or what they need? Wo gets to decide? You do, I suppose. Will there be any way, in your scheme of things, in which individuals with no ownership of anything can exercise any meaningful degree of individual liberty? I doubt it. You come pretty close to the old trope that Communism hasn't failed, it simply hasn't been tried. Well, it has been tried, and since it essentially requires the abolition of individual freedom and the transfer of all political power to a central dictatorship, it has not ended well whenever it was tried. You seem shocked by the notion that Lenin might be compared to Hitler (not, so shocked, it seems, by the mention of Stalin, Mao and Pol Pot). Under his leadership the Gulag, the Red Terror against the farmers, the Polish War, the New Ecomonic Policy and resulting famine, all make the comparison apt, even if you don't like it. The evolution of the concepts of private property and individual rights, and the rule of law, and equality before the law, are sufficiently complex that the summary "private property was the prerequisite and the cause of the gross inequalities which arise under capitalism, and that private property originated as theft" can best be characterised as just plain wrong. Its general truth is easy to demonstrate: it always originates as the enclosure of land previously held in some variant of common. Sure, this changes over time to become more and more like modern private property, but feudalism also originated as theft; it's just that the nature of the theft has become more and more complete. In aboriginal society, including that of our ancestors as well as everybody else's, to live on and work the land was a birthright. This was unjustly taken away for the benefit of those who took it. To unjustly take something away is theft. I say the same about the right to a family and a community. These are not things that people should have to qualify for or "earn." I am advocating the restoration of the rights that people for the most part have always had, those which most would have agreed that people should have had even when they did not. In the same way that the American Revolution invoked the traditional rights of Englishmen, I am invoking those of Englishmen and of humanity in general. My criticism of capitalism is ultimately conservative, and that I suppose is what most distinguishes me from Marxists. Maybe if I called private property Bid'ah it would help you understand. If you mean numerically equal, then that is not consistent with "to each according to his needs", as people who are very young, or very old, or very sick, need a larger and so unequal share of resources. Which do they get? Numerically equal, or what they need? This is a sophomoric objection. First, you are really saying that their share of resources is not commensurate with what they currently produce. One might ask what they have produced, what they will produce, what they might have produced had they the chance, etc. It's not obvious that children require more resources than do adults, only that they produce less in the near term. If one employee gets reimbursed for expenses, or paid for sick days, do you say that he or she has been paid more than another employee? If someone requires surgery to save their life, is this the same as being paid more? It seems like a way to say that equal outcomes are actually unequal because some are less profitable than others. I guess real equality would mean letting children, the crippled and the infirm starve to death? And since we do not advocate this real equality, we must accept historically extreme levels of inequality to avoid being hypocrites? Of course we were challenging the whole concept that people should be sustained or not according to what they allegedly "earned," which is under capitalism an arbitrary and logically circular metric of the form "they own it, therefore they earned it." What counts as earned is black-boxy and undocumented, and this is actually touted as a virtue of the system, since only the black box is really objective and fair. Exactly because it is a black box, there can be no real argument for or against it other than to look around you and decide if this is true. Now, what exactly is it that YOU mean to defend? How do YOU think it should work? One guy gets $150 billion while others are made homeless? Because his labor is really worth theirs times close to infinity? This is a romantic view driven entirely by your modern view about how things ought to have been and it is not supported by evidence. The romantic notion of the noble savage and all that goes back at least to the Romans. It was romantic nonsense then and it's romantic nonsense now. My criticism of capitalism is ultimately conservative, and that I suppose is what most distinguishes me from Marxists. Maybe if I called private property Bid'ah it would help you understand. Maybe if you had not called youself a communist it would have lessened the confusion: claiming to be a communist who isn't a Marxist is a position that requirs more than a little explanation to be convincing. Calling private property a heresy does not help in the least, but you knew that anyway. This is a sophomoric objection. Which does not make it any the less valid. "Sophomoric" is an insult, not a refutation. First, you are really saying that their share of resources is not commensurate with what they currently produce. One might ask what they have produced, what they will produce, what they might have produced had they the chance, etc. It's not obvious that children require more resources than do adults, only that they produce less in the near term. If one employee gets reimbursed for expenses, or paid for sick days, do you say that he or she has been paid more than another employee? If someone requires surgery to save their life, is this the same as being paid more? It seems like a way to say that equal outcomes are actually unequal because some are less profitable than others. I guess real equality would mean letting children, the crippled and the infirm starve to death? And since we do not advocate this real equality, we must accept historically extreme levels of inequality to avoid being hypocrites? What I'm really saying is what I sais before, namely that you are advocating that everyone in the world should have an equal share of the money, and this persiflage is an attempt to disguise the fact that it doesn't work out very well for some people. The numerically equal share of the world's capital is about $40,000 a head, or an income of around $1,000 a year. The very old, the very young and the very sick could not survive on that, and are unable to provide labour in return for the extra food, support or medication that they need to live. So, do you give them what they need (and who do you take it from) which is more than their numerically equal share, or do you leave them with their numerically equal share and wait for them to die? Which is it? It's your system, you have to choose. I think that people could and should behave better, and I do not think that the way to achieve that is to abolish private property and individual freedom, or to propose internally inconsistent remedies or to go on about some romantic notion of a non-existent past golden age. I haven't proposed anything concrete here, because it's a complex problem which is not amenable to the simplistic notions that people like to propose in chat rooms. Property rights are fundamental to everything else. The founding fathers knew this. Well, I doubt that we will resolve these great issues here. But I make no bones about finding people saying in chat rooms "Speaking as a communist ..." similar to "Speaking as a fascist ...": or "I'm a communist but not one of those murderous Marxist types" similar to "I'm a nazi but not one of those murderous Hitler types".